Children and youth with autism spectrum disorder (ASD) struggle to varying degrees with social situations – that much is widely known. However, many also have motor deficits and other health conditions. 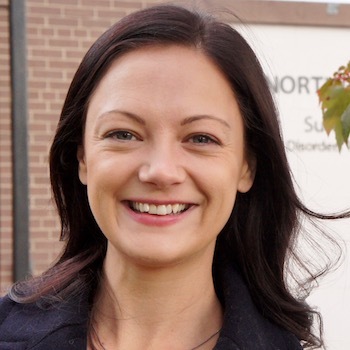 Wilfrid Laurier University’s first-ever student to earn a PhD in Kinesiology is shining a spotlight on these lesser-known autism-related issues. Though perhaps less visible than their social deficits, children on the autism spectrum often struggle with fine and/or gross motor skills, says Redquest. However, these vary widely – for example, one child may be a great runner but have illegible handwriting, while another may have beautiful handwriting but struggle with running. Motor issues may be partly related to the fact that people with autism generally have difficulty imitating others. Both social and motor skills are learned to a large extent through imitation. One aspect of Redquest’s research involved asking children with ASD and a comparable number of children without ASD to complete a series of assessments involving skills such as catching, throwing, balance, manual dexterity and reaction time. She also asked the children to imitate various actions she performed. Redquest found that not only did the children with ASD have significantly lower motor skills, those who were worse at imitating had worse motor skills. In the neurotypical children, there was no relationship. However, people don’t just learn motor skills through imitation – they develop them through practice. Here, Redquest found the social challenges of autism may be contributing to children’s difficulties. “What kids do on the playground is active play, so if a child can’t engage with their peers, it’s a barrier to both their social and motor development,” Redquest says. One parent Redquest interviewed gave an example of how social difficulties can become barriers to motor development. Redquest was surprised to find parents were significantly less concerned about their children’s motor development than their social development. Sleep issues and anxiety are indeed among the challenges for children with autism, according to Redquest’s research, which was largely based on a database of comprehensive, multidisciplinary mental-health assessments for children and youth who are referred to developmental services in Ontario. Sleep problems, which include not being able to fall asleep and/or waking up in the middle of the night, are frequent. Mental health issues are also “very common,” says Redquest. “Children with ASD across the spectrum are not getting enough physical activity. That’s a huge area of concern because we know physical activity can alleviate many of the issues and challenges they experience." Children and youth with autism also commonly suffer from bullying, which can lead to depression and anxiety. Although Redquest found most health issues she investigated to be similar in high- and low-functioning individuals, bullying was an exception. Interventions for children with autism usually concentrate on social skills and behaviour – not many address motor deficits or other health challenges. Redquest wanted to help fill that gap. Under Bryden and Fletcher’s supervision, Redquest and fellow Kinesiology graduate student Nicole Reinders began Movin’ and Groovin’ in 2015. Run at the Waterloo location of KidsAbility, the weekly program for children with a wide range of disabilities teaches motor skills in a fun and supportive environment. Not only does the program help children with disabilities, it indirectly informed Redquest’s research by letting her get to know individual children’s personalities, abilities and challenges. Redquest is now a postdoctoral research associate with the Centre for Addiction and Mental Health, a psychiatric teaching hospital in Toronto. She plans to continue a career in research involving people with disabilities, whether in a health-care setting or in academia. She has left Movin’ and Groovin’ in good hands – Reinders and two other students are running it now. However, Redquest says she misses the kids she got to know. Potential areas of research in Laurier’s PhD program in Kinesiology include movement science, health, psychology of physical activity, sport development, and sociocultural aspects of sport and physical activity. For more information, contact Professor Mark Eys.